Your vehicle's paint is actually a very delicate surface that needs regular attention in order to have it looking it's best. Proper washing, drying, polishing, and protecting will keep the paint and other exterior surfaces from becoming gritty, dull, swirled, scratched, and oxidized. Statistics have proved that a vehicle polished and waxed/sealed 2-3 times a year can average 15 years (outdoors) before needing a new paint job. 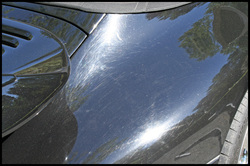 A vehicle without any polishing and waxing/sealing will need a new paint job typically after only 8 years. To put this in perspective, a standard (OEM quality) paint job averages $3000. Let's look at some typical problem areas. 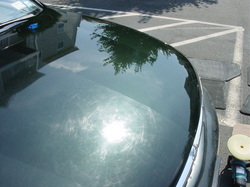 remove these problems leaving your paint silky smooth and contaminant free. Notice in the picture below how the folded over piece is bright grey whereas the other sections are brown and black with contaminants. Dull paint: dull, lifeless paint comes over time from improper care. Improper care ranges from improper washing and drying techniques, to not washing your car, or dragging anything but a clean towel or wash mitt across the surface causing it to "swirl" and leaving it dull. 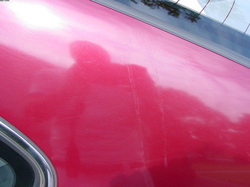 Swirls are very light scratches in the paint's surface caused by an abrasion. This will come inevitably over time, but swirls need to be removed in order to keep your finish looking it's best. 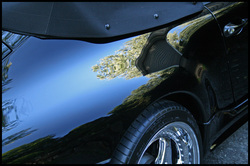 Polishing with the right polish, pad, and procedure will make your finish look shiny and new. Then, top it off with a high quality carnauba wax or paint sealant and you have yourself a car that looks arguably better than the day it came off the showroom floor! Using the right tools, product, and technique, I was able to bring the shine back. Here is an excellent example of a deteriorated finish. On the left shows the raw form of heavy swirl marks from poor washing and paint care techniques. On the right you see the optically clear surface which was compounded and polished to bring up an amazing shine. Oxidized Paint: oxidized paint comes from a lack of surface care. If your paint is oxidized it will look hazy and cloudy due to the chemical reaction of oxygen with the dirt and contaminants on your paint. A simple way to keep this from happening is to wash your vehicle weekly and use a good carnauba paste wax or paint sealant every 3 months or every oil change. 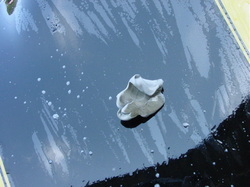 However, the proper way to remove oxidation fully is to clay bar the car, polish it, then protect (wax or sealant). 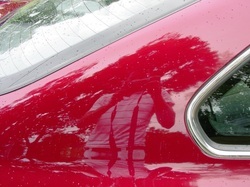 Oxidation is very common in red cars...This leaves them turning "pinkish". After claying, compounding, polishing, and sealing, this red is deep, rich, clear, and vibrant (please excuse the raindrops).